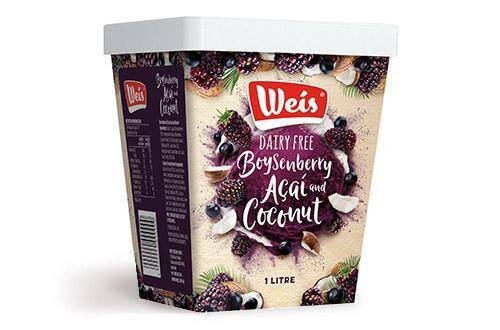 Weis’ Super-fruity Boysenberry, Acai & Coconut dessert is deliciously smooth and creamy… Oh and it’s dairy free too! Tart Boysenberry and Brazilian Acai balanced with cream coconut – this dairy free dessert is hard to beat! Boysenberry & Acai Frozen Dessert Ingredients: Water, Sugar, Boysenberries (9%), Pomegranate Juice, Blueberries, Coconut Paste (3%) (Desiccated Coconut, Stabiliser (471)), Acai Puree (3%), Vegetable Gums (Carob Bean Gum, Guar Gum), Fibre, Citric Acid.